68 days and counting to this year’s Thunder Over Louisville – the Kentucky Derby Festival’s Opening Ceremonies. The Festival announced the theme of this year’s show and named the event’s sponsors at their headquarters this morning. 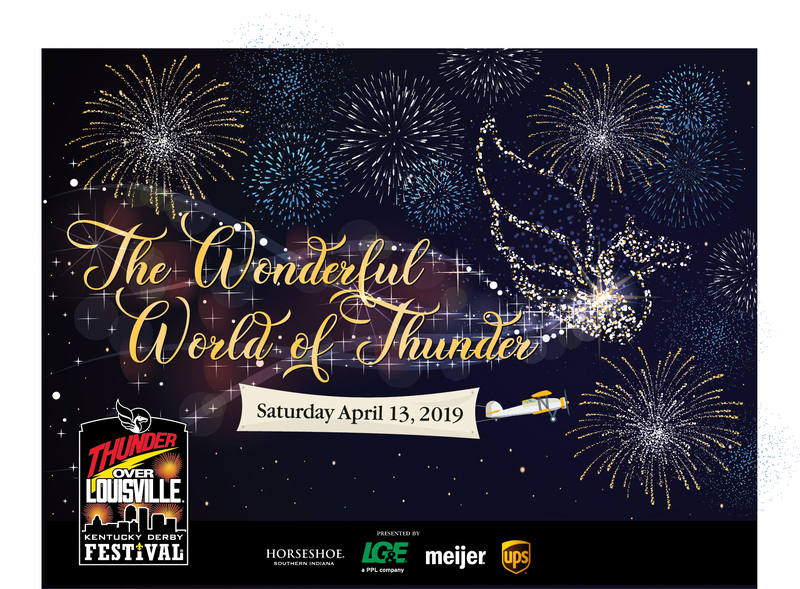 This year’s theme – “The Wonderful World of Thunder” – will celebrate 30 years of the show with a soundtrack of songs from everyone’s favorite fairytale and animated movies. Horseshoe Southern Indiana, LG&E, Meijer, and UPS return as Presenting Sponsors of the day-long event set for Saturday, April 13. This is the 29th consecutive year that UPS has been a presenting sponsor of Thunder Over Louisville. Horseshoe Southern Indiana has been a presenting sponsor for 20 consecutive years. LG&E and Meijer have both been Thunder sponsors for the past 13 years in a row. In addition to the presenting sponsors, Ford Motor Company returns as title sponsor of Ford’s Thunder on the Ground and Papa John’s returns as title sponsor of Papa John’s Thunder Funder program. Logan Lavelle Hunt is the Official Sound Sponsor and The Galt House is the Official Hotel of the event. 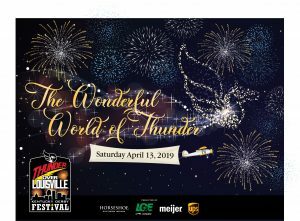 Thunder Over Louisville’s 2019 Official Broadcast Partners are WAVE 3 News and SummitMedia’s 106.9 PLAY. The Festival is also planning for another packed air show in 2019. The show will feature the U.S. Army Golden Knights, the KC Flight Formation Team, the 6-ship Trojan Thunder Team, Younkin Airshows and many more. Additional details on the 2019 Thunder Air Show will be released closer to the show date. Fans lined the street as the Kentucky Derby Festival’s oldest and inaugural event – the Republic Bank Pegasus Parade – marched down Broadway tonight. Themed “#ThrowbackThursday,” this year’s parade featured over 100 units, including 10 floats, 13 equestrian units, 5 inflatables, 8 marching bands, 2 push floats and 42 specialty units. 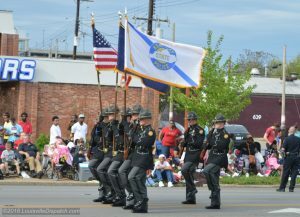 Check out the Louisville Dispatch photo gallery of the parade on Facebook. Former coaching rivals and basketball fan favorites Joe B. Hall and Denny Crum were the parade’s Co-Grand Marshals. The Louisville City FC 2017 USL Championship Team, along with the Kentucky Colonels served as Honorary Grand Marshals. Other guests included: Brittany Cartwright and Jax Taylor of Bravo TV’s “Vanderpump Rules/Jax and Brittany Take Kentucky,” Monte Durham of “Say Yes To The Dress:Atlanta,” Montel Williams (actor, television and radio talk show host), Jason Smith of Food Network, Judah and the Lion, Miss Kentucky 2017 Molly Matney and Miss America 2018 Cara Mund. Taking a lesson from Willy Wonka, the Kentucky Derby Festival’s Foundation is giving away a Golden Ticket for the 2018 Festival. The lucky winner (and a guest) will experience the Derby Festival like never before! The Golden Ticket includes a Derby Festival package valued at $3553. This is a once in a lifetime chance to attend many of the Festival’s most anticipated (and often sold out) events. Raffle tickets are 50 dollars each and ONLY 500 will be sold. Taking a lesson from Willy Wonka, the Kentucky Derby Festival’s Foundation is giving away a Golden Ticket for the 2018 Festival. The lucky winner (and a guest) will experience the Derby Festival like never before! The Golden Ticket includes a Derby Festival package valued at $3553. This is a once in a lifetime chance to attend many of the Festival’s most anticipated (and often sold out) events. Raffle tickets are 50 dollars each and ONLY 500 will be sold. The Golden Ticket raffle is also for a good cause. Proceeds benefit the Kentucky Derby Festival’s Foundation – the charitable arm of the Derby Festival. The Golden Ticket raffle is coordinated by The Fillies, Inc., a volunteer organization that works closely with the Derby Festival year-round. 2 complete sets of 2018 Pegasus® Pins – including a Gold Pin! Raffle tickets are on sale NOW. They can be purchased at the Derby Festival office at 1001 S. Third Street in Louisville, by calling (502) 584-FEST, or online at KDF.org. The winner will be drawn at the Macy’s Derby Festival Spring Fashion Show at Horseshoe Southern Indiana in March. Mayor Greg Fischer and Ocala (Florida) Mayor Kent Guinn today made their annual wager on the Kentucky Derby, placing a new Louisville bourbon and Ocala brandy on the line. This is the fourth year for the friendly wager between the mayors of the two cities, both steeped in thoroughbred tradition. Mayor Fischer chose J Boys Echo, trained by Louisvillian Dale Romans, as his winning horse. “It’s time for this Louisvillian to get into the Derby Winner’s Circle,” the Mayor said. Mayor Guinn is predicting favorite Classic Empire will emerge victorious in the Derby. Classic Empire, son of Pioneer of the Nile, has traditional Florida bloodlines of Unbridled, Fappiano, Dr. Fager and In Reality. But mostly, Mayor Guinn said he chose him because he is a big fan of trainer Mark Casse, who grew up in Ocala. Last year, Mayor Guinn’s pick, Gun Runner, finished third, and Mayor Fischer’s selection, Brody’s Cause, finished seventh. So no spirits were exchanged. Mayor Fischer’s bet this year is a bottle of the new Old Forester Statesman from Louisville’s Brown-Forman Corp. The company announced earlier this week that Old Forester Statesman will debut in acclaimed filmmaker Matthew Vaughn’s upcoming 20th Century Fox film, “Kingsman: The Golden Circle,” and will available for film fans and bourbon aficionados to enjoy in August. Mayor Guinn again bet Marion Black 106 —the Spirit of Florida Tangerine Brandy, distilled by Fishhawk Spirits of Ocala. Students from around Kentucky and Southern Indiana will compete in the 24th annual Ford Motor Company Kentucky Derby Festival Spelling Bee today at 11 a.m. in the Bomhard Theater at the Kentucky Center for the Arts (501 W. Main Street in Louisville). 64 students representing 62 counties will compete on Saturday. They qualified by winning their respective school and county bees. Said Kimberly Hofmann, Ford Zone Manager for the Cincinnati region: “As one of the top employers in the state, Ford is proud to help recognize the dedicated and talented students from all over the region in the Kentucky Derby Festival Spelling Bee.” Ford’s commitment to driving a brighter future in Kentucky is well served by supporting this important educational event. The overall champion of this year’s Spelling Bee will receive the John & Joan Murphy Memorial Scholarship Fund, a $10,000 U.S. Savings Bond at maturity. 2nd Place receives the Barbara Cox Memorial Scholarship, a $5,000 U.S. Savings Bond at maturity. The next three top finishers also receive savings bonds – $3,000 for third, $1,500 for fourth and $1,000 for fifth. The prize money will be provided by the Kentucky Derby Festival Foundation – the Derby Festival’s charitable arm. In addition to a $10,000 saving bond, the overall Spelling Bee champion will receive a Britannica online subscription gift certificate, Blue Orange Games: Speedeebee, an Amazon.com gift card and a trophy. The winner will also have the opportunity to ride the Winner’s Float in the 62nd annual Republic Bank Pegasus Parade on May 4th. The Kentucky Derby Festival Spelling Bee is sponsored by Ford Motor Company, with Media Sponsors Kentucky Monthly and 840WHAS. Derby Festival Fans can help pick the next ‘Derby Burger’ Champion. Dozens of original recipes were submitted for the competition sponsored by the Kentucky Beef Council. Those recipes featuring 100% beef have been narrowed to the top 8 recipes. Voting is open online to help choose the top 4 burgers that will move on to the finals of the 2017 Derby Burger Challenge. Today through March 16, fans can visit KDF.org/Beef to vote for the burger they want to see make it the cook-off portion of the event. This is the sixth year for the Derby Burger competition. “Everyone loves a juicy burger! Whether you’re gathered around the grill with family or looking for a lunch option to get you through the day, burger recipes offer something for everyone’s taste buds. The Derby Burger Challenge has been a great way for the Bluegrass to express their love for a great burger through all the inventive and exciting burger recipes. We are looking forward to seeing what this year has in store!” Steve Dunning, Kentucky Beef Council. The burger recipes are judged based on Taste, Appearance, Creativity and Ease of Preparation. The winning burger will be featured at Kroger’s Fest-a-Ville during Derby Festival, sampled at BeerFest presented by American Founders Bank and on the menu at Napa River Grill in May and June. Official rules of the competition can be found online at www.kdf.org/beef. The winning chef also receives VIP tickets to Thunder Over Louisville, tickets to Waterfront Jam, as well as a $100 gift certificate to Kroger and a grilling package from Kentucky Beef Council. Beginning Monday, March 13 through Friday, April 14, all purchasers of fresh ground beef at any of the Kentuckiana Kroger stores will receive a receipt message at checkout (on the bottom of the receipt). The message includes an entry code to register online at www.kdf.org/beef for a chance to win VIP tickets to a Waterfront Jam Concert at Kroger’s Fest-a-Ville or BeerFest presented by American Founders Bank. Since 1956, the Derby Festival has worked to bring the community together in celebration. The Festival is an independent community organization supported by 4,000 volunteers, 400 businesses and civic groups, Pegasus Pin sponsorships and event participation. This involvement has made the Festival the largest single attended event in Kentucky and one of the leading community celebrations in the world. Tickets are available now for the first ball of the Derby season – the annual Fillies Derby Ball hosted at the Louisville Marriot Downtown. This ball is one of the Kentucky Derby Festival’s oldest and most elegant events. Themed “The Royal Ball,” the event promises to treat every guest like royalty. The event begins at 6:30 p.m. with cocktails, call to the post at 7:15, the Queen’s coronation at 7:30, all followed by dinner at 8:00. For dancing, live musical entertainment will be provided by The Sensations. The highlight of the Derby Ball – which is planned and produced by The Fillies, Inc. – is the coronation of the Kentucky Derby Festival Queen, selected by the traditional spin-of-the-wheel. The regal evening will be hosted by Vicki Dortch from WLKY TV with special guest Monte Durham, from TLC’s Say Yes to the Dress: Atlanta. Durham originally joined the Derby Festival in January to help select the five ladies that make up the Royal Court. At the Ball he will return to the festivities to help crown the Queen, along with Kathy Bingham, 2017 Fillies President. Contributing Sponsors of the event include the Brown-Forman Corporation and Total Wine & More. Media Sponsors are TOPS Louisville and 102.3 The Max. The Fillies Derby Ball is also the largest fundraiser for the Kentucky Derby Festival Foundation, KDF’s charitable arm. A portion of proceeds from the ball benefits the Foundation. Tickets are $175 each. VIP tables are also available for $2,500. Tickets include dinner and dancing. For tickets call (502) 572-3856.